Whether you’re looking to thin down, tone up or simply maintain your current physique, a natural latex body band can help! 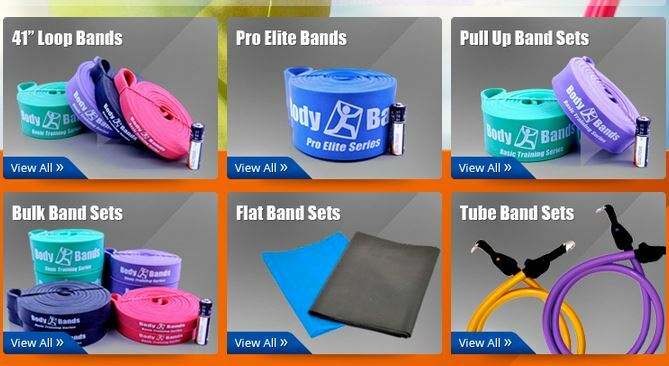 Without a brick and mortar storefront to eat up profit, Body Bands is able to effectively pass along these savings to their customers. 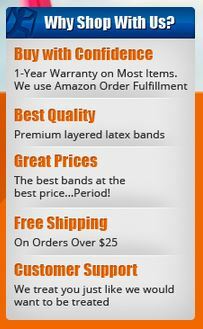 However, that also means they also rely solely on their custom eBay store design to get the bands into the right hands. Just above the custom logo is a search bar in which customers can elect to enter keywords or phrases for a targeted shopping experience. Below, an orange navigation bar sits prominently against an active body band user. It is here shoppers have the opportunity to read about the shop’s guarantees, company profile, selection help, shipping/return policies, or contact information. In the left sidebar a list of six vertical store categories help organize the inventory. The eBay Shop Design also takes care to help the store keep in touch with their most loyal buyers by inviting interested parties to sign up for the newsletter. For those who prefer a more visual shopping experience, the six category options are again laid out in a classy 3 X 2 spread. By clicking anywhere on the designated block, customers will be transported to a page with the full stock. Our snazzy eBay template designs also allow you to easily and effectively showcase popular or discounted items with a ‘featured products’ element. Jumping back over to the sidebar, our design experts have aptly highlighted compelling arguments which set Body Bands apart from their competitors. Many of these perks are addressed in other areas of the site; however, making them visible to patrons is a great way to effectively market your brand while simultaneously increasing consumer confidence! Finally, this snappy eBay store design closes with a custom footer. A mini sitemap takes shoppers through information housed in the main navigation panel while the logo rests comfortably in the bottom right corner atop accepted methods of payment. It’s hard to compete in the eBay retailer world but at OC Designs Online, we make the process of opening an eBay store easier—or if your eBay Shop Design needs a facelift, we are the most affordable eBay store designers you’ll find anywhere. Request a free Quote to get started. We also invite you to browse our portfolio of stunning eBay stores and don’t forget to find us on Twitter and Facebook!